All On Focus: Nothing To Report. the usual things is happening. well, no photos on a blog is defintely boring. I capture little bits and pieces, here or there...of all the wonderful moments i had with the people around. I take things that interest me and those i find memorable. And thats me. 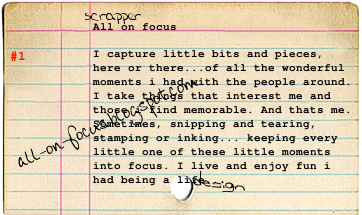 Sometimes, snipping and tearing, stamping or inking... keeping every little one of these little moments into focus. I live and enjoy fun i had being a life artist. I make sure I keep all (of life) on focus. And thats not only me. I love scrapbooking!! !Its been my life, I knew arts was in my blood but not scrapbooking finally i realised about how my hobby can help to bring everyone together, and live as one. However, things are always not as easy as it seems. But I try my best to keep positive. Amira - What Is It To Be Human? No part of this Blog may be reproduced, transmitted in any form or by any means, electronic (Internet sities, Blogs)or mechanical, including photocopy, recording or any information storage or retrieval system, without any prior permission by contacting Terence. However, personal use or keeping any information for one's keepsake like photo is exceptional. Also, without any means of contact, this is blog can be freely link by any communication means. Thus, it would be optional but, appreciated to leave a note for any notices.